Like buying a car online, online vehicle registration is easier, more convenient, and less time consuming than registering a vehicle in person. Instead of driving to your local licensing agency and waiting in line all day, you simply have to gather the necessary documentation, navigate to your state or county’s registration site, and fill out some online forms. In many cases, you can even choose to receive your registration documents and plates in the mail, which renders the process entirely painless from start to finish. 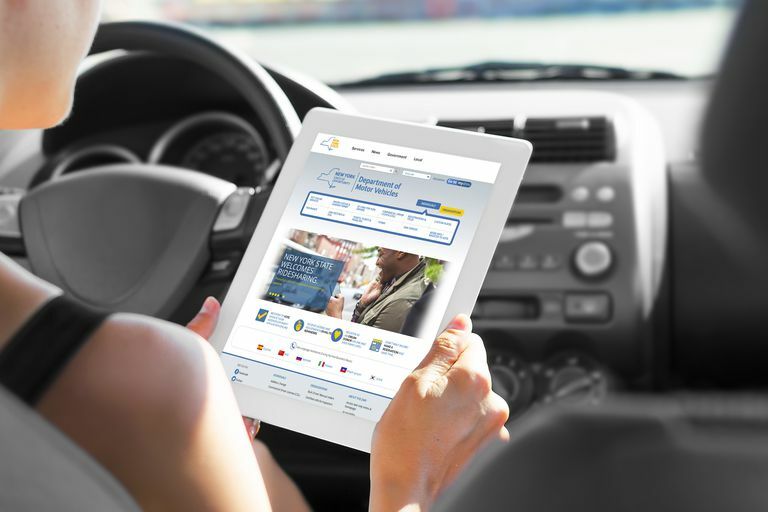 Who Can Register a Motor Vehicle Online? Anyone can register their car, truck, or even recreational vehicle online, provided that their state, county or local registration authority is set up for it. Most jurisdictions are up to date with this type of service, but there are still some holdouts. Expert tip: If you really want to avoid the hassle associated with purchasing a car, there are also several places you can buy a car online. If you navigate to your state or county’s vehicle registration site and find that the option isn’t available, you’ll have to visit the appropriate agency in person. There is also an important distinction between a first time vehicle registration and a registration renewal. Some states and counties allow both types of registrations online, while others only allow new vehicle registrations and title transfers to take place in person at the Department of Motor Vehicles (DMV), Motor Vehicle Department (MVD), Department of Licensing (DOL) or other relevant agency. The specific information or papers that are required in order to register a vehicle online can differ somewhat depending on your location, but there are some basic documents that you’ll want to get together before you attempt an online registration. A title that has been issued in your name. Paperwork that says you have passed a smog or emissions test. Documentation that shows you passed a vehicle safety inspection. If your vehicle was ever salvaged or wrecked, you’ll typically need additional documentation, like pictures of the wrecked vehicle, the original salvaged title, and you may need to have an additional inspection. First-time registrations, and registering a vehicle with a branded title, often require a physical visit to a local licensing agency. When in doubt, you should be able to find information about the process on the relevant agency’s website. A code or personal identification number (PIN) from your registration renewal notice. An account with the service that your state or county uses to process renewals. The exact process of renewing a vehicle registration online differs from one area to the next, because registrations are typically handled at the county level. Since individual counties are able to devise their own renewal processes, you may run into peculiarities if you live in one area that you wouldn’t if you lived elsewhere. Navigate to the website of your local DMV, MVD, DOL, or other similar department. Locate a button or link that says renew registration. The specific wording may be different than that, and you will likely have to differentiate between automobile and other types of registrations, such as watercraft. Create an account with the service that handles registration renewals in your area, or sign in if you have an account. In some places, this step isn’t necessary. If prompted, enter the code or PIN from your renewal notice into the appropriate field. If prompted, enter the requested combination of your last name, vehicle plate number, or VIN. Keep in mind that when you originally titled your vehicle, the clerk may have typed your name wrong or transposed your first and last names. Verify that the correct vehicle comes up and that other information, such as your mailing address, is correct. Select a payment method and pay for the registration. Major credit cards are usually accepted, but you may also be able to pay via electronic check. You will then have to select a delivery method for your registration, plates, stickers or tabs. You may have to pay extra if you want these items mailed to you, and you sometimes have an option to pick them up in person. Finally, you will need to print your renewal receipt or invoice and file it away for safe keeping. What If Your Registration Sticker Doesn’t Arrive in Time? While renewing a vehicle registration online is usually faster than renewing by mail, due to instantaneous processing, it still lags behind doing it in person. So if you renew your registration too close to your expiration date, you may find yourself in an uncomfortable situation. This is why it’s usually a good idea to just renew in person, or select the option to pick your registration up in person if your expiration date isn’t too far off. In some cases, you may not receive your documents or plates in time, even though it seems like you renewed early enough to avoid a problem. When that happens, you’ll need to contact your local DMV, MVD or DOL to see what the problem is. This is why it’s so important to save and print your receipt or invoice from when you renewed. If you do find yourself in a situation where your registration is expired, but you absolutely have to drive your car, your receipt or invoice may be able to serve as a temporary proof of registration.